Senior Cami Drouin-Allaire performs her uneven bars routine during the EAGL Championship Saturday. Gymnastics entered Saturday’s East Atlantic Gymnastics League Championship as the favorite to take the title. But an uncharacteristic off-day for the Colonials – who are ranked No. 19 in the nation – led them to a third-place finish in a field of six with a total score of 195.875. NC State captured the conference title with a tally of 196.625 and New Hampshire came in second, finishing with a 196.300. Seniors Cami Drouin-Allaire and Jillian Winstanley, GW’s top two competitors throughout the season, finished in fourth and seventh place respectively out of seven competitors in the all-around. They both scored totals significantly lower than their average all-around scores over the past month. Drouin-Allaire was the only Colonial to reach the podium as an individual performer, with a first-place vault, to go along with an all-around score of 39.200. Winstanley’s all-around tally of 38.825 came after three events with a 9.80 or higher and struggles on the balance beam. The Colonials received four end-of-year honors during the awards portion of the meet – the most the program has won since joining the EAGL in 2005. Foster-Cunningham received her third-straight Head Coach of the Year award, while both of her full-time assistant coaches were also recognized. Drouin-Allaire was named EAGL Senior of the Year and received her second-career Gymnast of the Year Award, having previously won in 2016. Last season, GW won its second-ever EAGL title and returned several of its key contributors for one of the team’s best-ever seasons. Since the season began in January, the Colonials completed a perfect 5-0 sweep in conference action and tied their program-record total score of 196.875 in a home meet March 11. But the Colonials entered this year’s conference Championship short-handed – with senior Alex Zois sitting out for the second consecutive meet. Zois’ absence forced a shakeup in the Colonials’ lineup, including using three freshmen as event specialists. 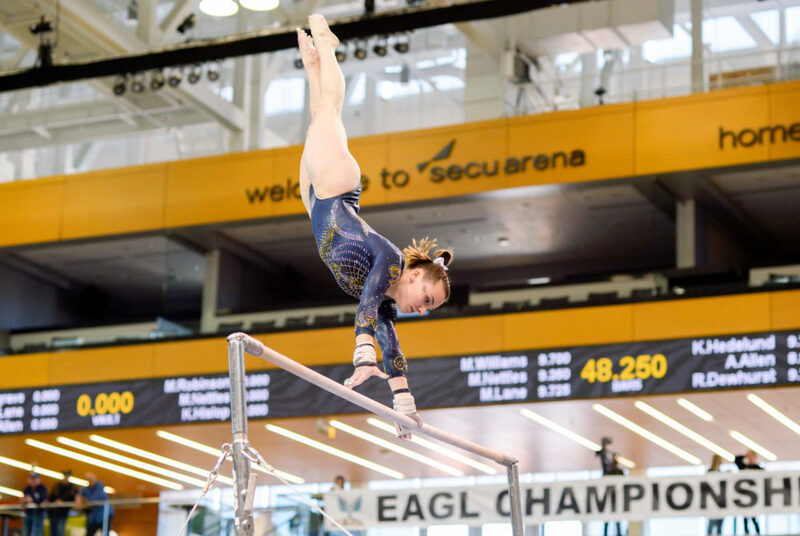 Despite the blow to the Colonials’ lineup, Drouin-Allaire said the young and less experienced gymnasts were well-prepared to step up and play a bigger role. GW had a strong showing during the first rotation on vault, scoring a 49.100 to tie Towson for first heading into the second rotation. Sophomore Cydney Crasa earned a career-high 9.825 on the event and Drouin-Allaire’s Yurchenko double full vault scored a 9.900 to grab a three-way tie for first place. It was the second straight vault title for Drouin-Allaire at EAGLs. After a bye in rotation two, the Colonials battled through the uneven bars despite a few form breaks. Winstanley led the squad with a score of 9.825 in the event and freshmen Hannah Cohen and Anna Warhol posted results of 9.750 and 9.725, respectively. GW moved on to beam for its third event of the day. Senior Liz Pfeiler’s 9.850 was good for team lead and tied for fourth on the day. Drouin-Allaire posted a 9.825, while senior Sara Mermelstein and Cohen received matching 9.800s. In the final rotation, when it was becoming more clear that GW would not repeat as champions, the Colonials closed with a 49.025 on the floor. Crasa earned another career-high on the event with a team-leading 9.875 and freshman Catherine Karpova, who made her floor debut in the last meet of the regular season, earned a career-high 9.825. After the competition, gymnasts said they will try to use the disappointing result to motivate them heading into NCAA Regionals, for which they already received an automatic bid. The Colonials will learn where they will compete next at the NCAA Gymnastics Championship Selection Show Monday at 4 p.m.